During the early-to-mid 19th century, a number of ladies’ seminaries sprang up, especially along the East Coast. The idea behind these institutions was that a superior education would reinforce Christian values, aid in personal maturity, and better equip young women of the “modern age” to be good wives and mothers. Those who were not so “lucky” as to marry would possess the knowledge and credentials necessary for the teaching profession and thus earn their own livelihood. There was a great demand for teachers, as the common schools grew and compulsory early education flourished. Despite the number of ladies’ seminaries, however, there was great resistance to offering women the rigor of a college curriculum. It was the prevailing opinion of the time that a woman would endanger her health with exhaustive studying, even if she were mentally capable of such an endeavor. In 1875, notable retired Harvard Medical School professor Edward H. Clarke, M.D. wrote a paper about it, in which he warned that a woman could place her health at great risk, including her “delicate female apparatus,” by such mental strain. To read the original treatise, click here on the Project Gutenberg link. Many worried, too, that years of rigorous academics, combined with living away from home and lack of parental oversight, would strip girls of their femininity and make them unmarriageable. But this early generation of young ladies clung to their aspirations. They proved they were capable of scholarly work, and became the future professors, deans, and presidents of the later women’s colleges. They networked with each other, agitated for change, and secured the endowments and wealthy benefactors to make it happen. 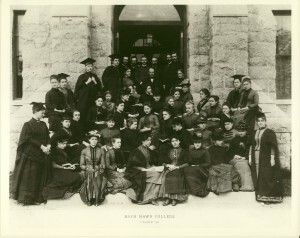 The most significant network of women’s colleges during the late 19th century (and beyond) was the group of colleges known as the “Seven Sisters”: Vassar, Smith, Bryn Mawr, Wellesley, Mount Holyoke, Barnard, and Radcliffe. Besides adhering to strict academic standards for admission and curricula, these colleges provided an inspiring environment for their students, with a high percentage of women faculty and administrators. Bryn Mawr in particular has enjoyed a preponderance of women presidents, for 111 out of the 128 years of its existence. 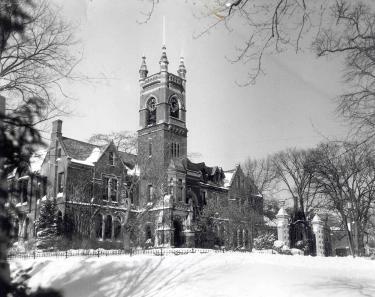 Women’s colleges in general helped to fuel the women’s suffrage movement, which of course sparked apprehension among conservatives of the time, and contributed to the perception that such places were hotbeds of radicalism. In terms of decorum and day-to-day student life, however, nothing could be further from the truth. The large seminary-style dormitories the girls lived in at first were soon adapted to “cottage” style arrangements, with the intent to better mimic domestic home life. Women faculty and staff matrons lived with the students, chaperoned them on outings, and screened visitors (especially gentlemen visitors). Many colleges had compulsory chapel attendance, and the widespread “ten o’clock rule” (lights out) was strictly enforced. But within this structure, the girls were given a lot of freedom, and student codes of behavior came to be self-regulated within the community of their peers. And there was always something to do. College didn’t really change what girls were interested in; it merely expanded the vista. Fashion, cooking, teas, studies, sports, theatricals, dances, pranks, ceremonies, traditions – each of these were part of the woven tapestry of student life.